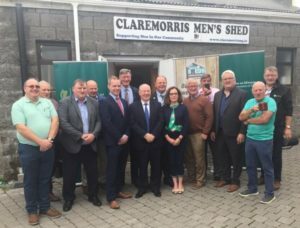 The Minister for Rural and Community Development, Mr Michael Ring T.D., today announced the provision of €500,000 to support the work of Men’s Sheds throughout Ireland. This capital funding provides small grants to individual Men’s Sheds in order to enable them to purchase equipment or to carry out minor works to improve their premises. Speaking at the announcement of the funding in Claremorris Men’s Shed, Co Mayo today, Minister Ring said: “The emergence of the Men’s Sheds in recent years has been an extremely positive development for communities across Ireland and I have decided to introduce this funding in recognition of the wonderful contribution they make at a local level. “In towns, villages and cities which I have visited as Minister, I am continually struck by the great work that local Men’s Sheds do in supporting important local initiatives. Among their ranks they have great expertise, experience and know-how and make a massive contribution to their local communities. “For example, in Claremorris Men’s Shed, which I visited today, the members were very involved in providing stewarding and making signage for the Claremorris Darkness Into Light event. They also made scarecrows in their workshop which were displayed around the town during the local Claremorris Scarecrow Festival. I’m aware that many Men’s Sheds support Tidy Towns groups as they prepare their local communities for that competition. “There are approximately 350 Men’s Sheds groups which are affiliated to the Irish Men’s Sheds Association, and I would like to see as many of them as possible avail of this funding. It is up to the individual Sheds to submit applications to their Local Community Development Committee (LCDC) in order to avail of the funding and I urge them to do so by the 31 August deadline. Application details can be found on my Department’s website (www.drcd.gov.ie) and on Local Authority websites. Barry Sheridan, CEO of the Irish Men’s Sheds Association, welcomed the news, stating: “This announcement is the most significant development in the history of Men’s Sheds in Ireland, and we as an Association are delighted to have played a role in bringing it about, via our consultations with Minister Ring’s Department. This level of support reflects the impact Sheds are making on communities throughout Ireland. Blood Pressure – what you need to know Stroke – Would You Know What to Do?